Welcome! We are on day 1 of our Sems L&K swimsuit sew-a-long! 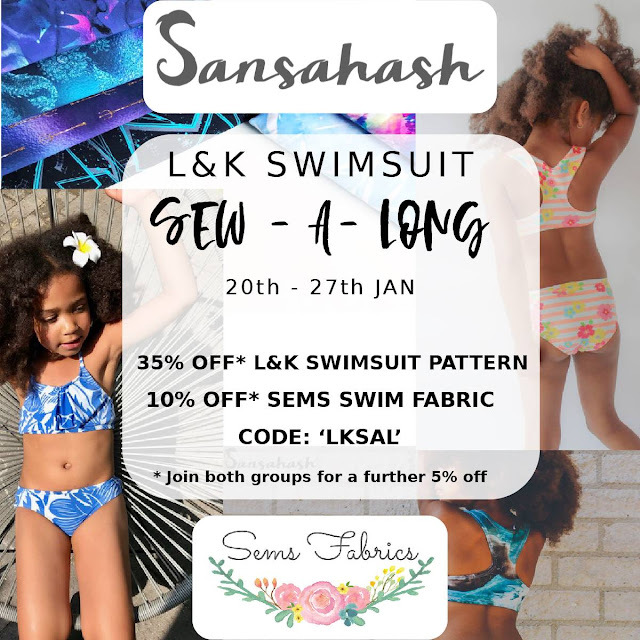 If you have not taken part in a sew-a-long (SAL), it's very simple, each day for a week, we will all sew a step together of our L&K swimsuit. There will be 2 days to catch up at the end and then Katie & Amyee of Sems Fabric will choose 2 winners! First prize will be a $75 Sems Fabric voucher & 2 Sansahash PDF patterns of choice. Then a second prize for most creative swimsuit will win a $50 Sems Fabric voucher. The only rules are that you use Sems swimsuit lycra and the Sansahash L&K swimsuit pattern. You may hack, and embellish your swimsuit however you like! We can't WAIT to see what you sew! To be in the running, you will need to join the Sems Fabric Facebook group HERE. (Entries can be a modelled or flat lay of your swimsuit and will need to be submitted to the "Final entry" album in the group. You can purchase your Sems fabric HERE. The L&K swimsuit pattern by Sansahash is available HERE. Join the Facebook Sansahash pattern group HERE. The L&K swimsuit pattern comes with 2 top options and 2 bottom options. You will need to select the view you would like to sew. You may also choose to hack these versions. I will show you how to achieve the 2 different looks I achieved with the L&K pattern. Download your L&K pattern. Measure your child accurately and print out applicable size(s). Grade your pattern pieces if needed! This ensures a snug, well fitted swimsuit, very important for swimmers! Fabric pieces for standard racer back version and vintage shorts. Don't forget to cut your lining too! 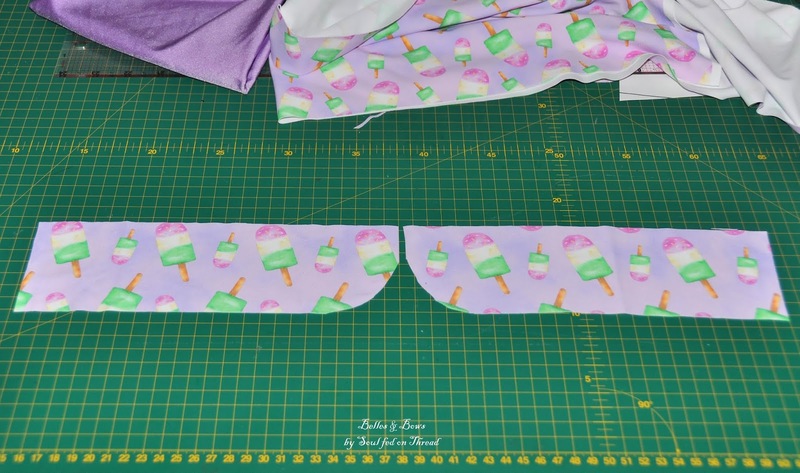 I will be providing tips and a basic run down of the steps we are sewing each day, however, please refer to your pattern tutorial for in depth instruction. Some of your swimsuit needs to be lined. I have used a soft stretch nylon, lycra blend netting for my lining. If you don't have specific swim lining fabric, then use your main fabric for your lining too. I strongly recommend a similar weight fabric for the lining for the RACER back version in particular as the technique used to construct this top will leave the neck and armholes prone to stretching out of shape as there is no supporting elastic in these areas. Pieces required for the pleated halter neck & bikini bottom version. 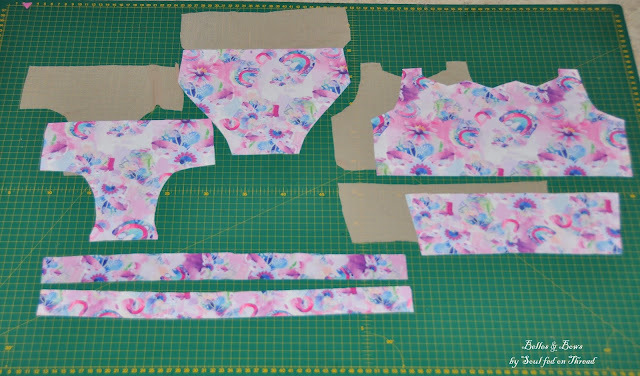 If you would like to re-create the tankini version of the L&K swimsuit, you will also need to cut out 2 "skirt" pieces for your top. The width of the skirt will depend on how much ruffle you like. Measure the width of your front LINING pleated pattern piece, then multiply this width by 175% - 200%, so your ruffle is twice or nearly twice as wide as your pattern piece. The height of these pieces can be cut as tall or short as you wish! 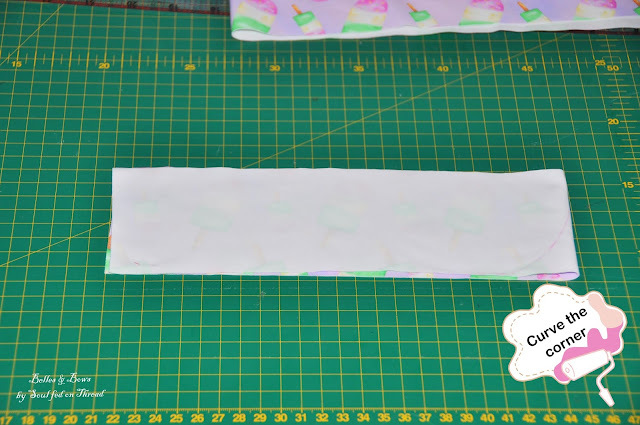 I recommend holding the front bodice pattern piece up against your child and measure down to the desired length. 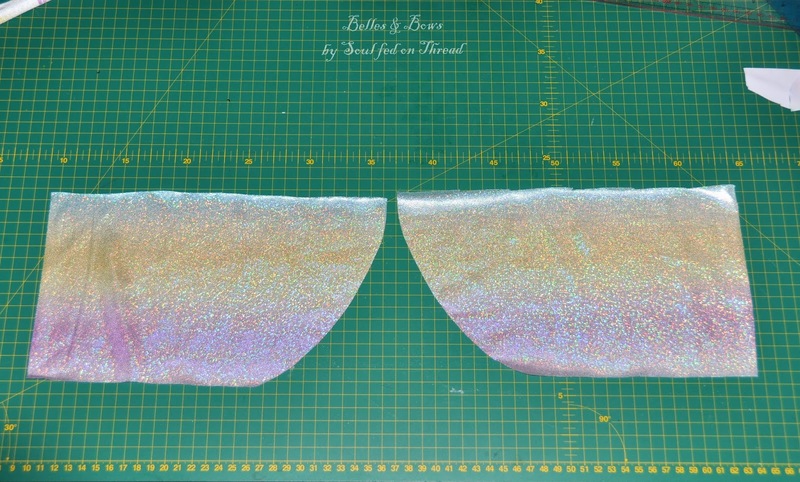 For a size 5 height, I used a height of 15cm (or 6") for my skirt pieces. If you have never drafted your own pattern pieces before this can be challenging! 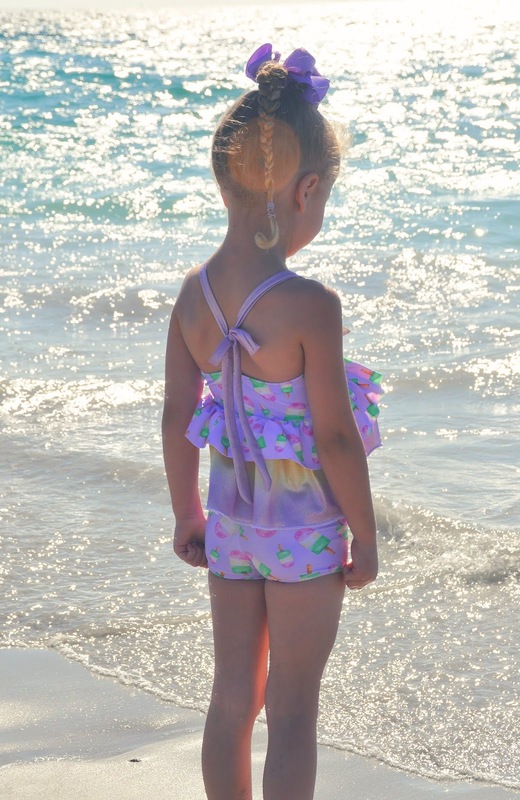 The ruffle tankini version will require you to print out the pleated halter neck version of the pattern. 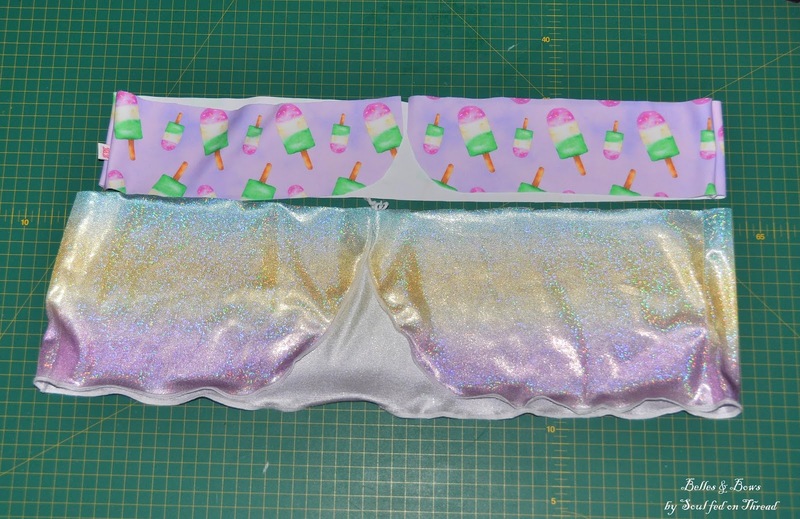 You will use the back piece as is, however you will be recreating the front. Use the pleated bodice version LINING piece, measure the HEIGHT from the centre bottom to top (so to the lowest part of the "v".) Then measure the WIDTH across the front - grade if necessary. 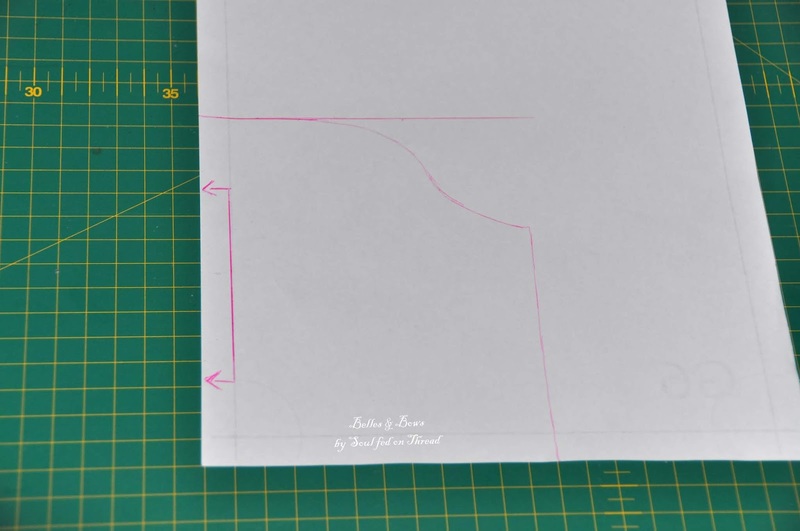 Draw a rectangle using these measurements - remember that your piece will be cut ON THE FOLD. After your rectangle is drawn, you will carefully need to curve the top right corner. This will follow towards your child's underarm. Cut out a MUSLIN FIRST! If your piece doesn't look right when holding against your child, re-cut! 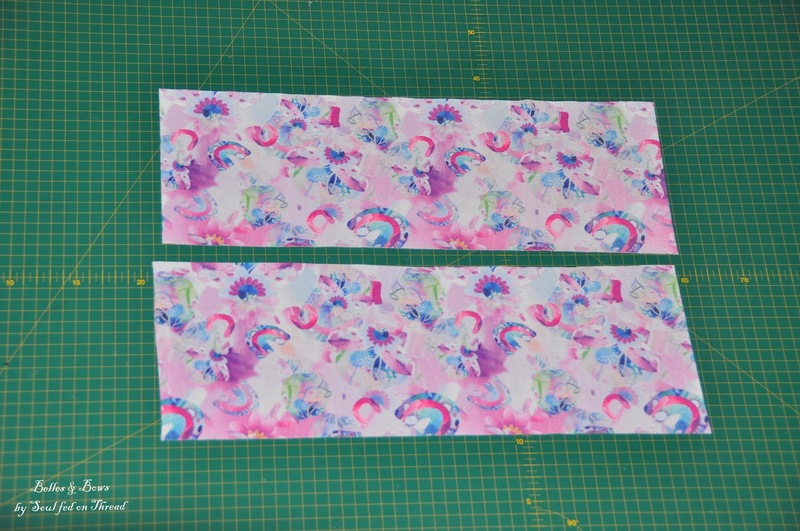 Remember there is a 12mm or 1/2" seam allowance! I made 2 layers of skirting, one half the height of the other. To recreate my look you will cut a total of 6 skirt pieces! Once again measure the width of your bodice pattern piece, multiply the width by 2. Cut 2 pieces at this size. Take one piece, fold in half and round off the bottom corner. A cup makes for a good template! Cut around the curve. Repeat the above steps for your lower layer of your skirt. The above pieces show the front skirts sewn to the back - however we are not up to this step! This is simply to show you all the pieces required for the ruffled tankini! Day 1 is now complete! 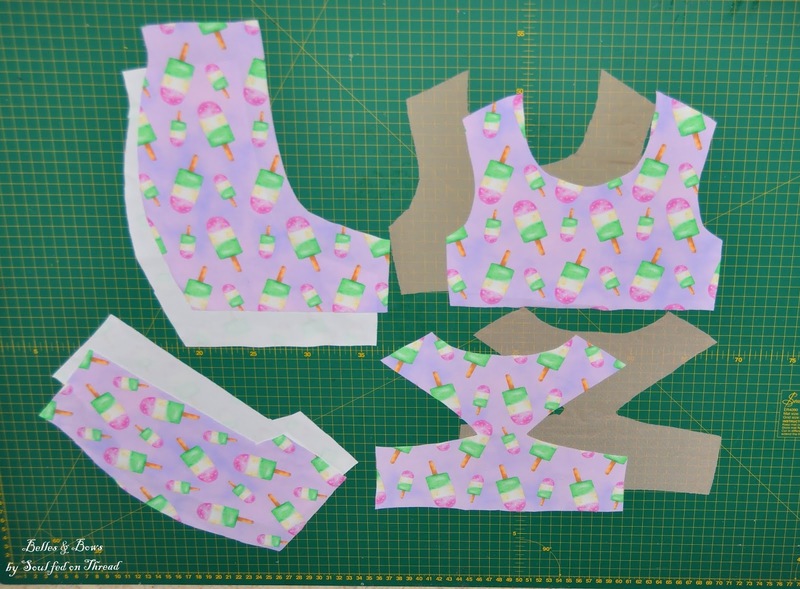 After today you should now have all your pattern pieces cut out ready for sewing! Go you! Please share your progress in the event in the Sems Fabric Facebook group, we'd love to see what fabric you picked! Stay tuned for day 2 (Monday 22nd January 2019).